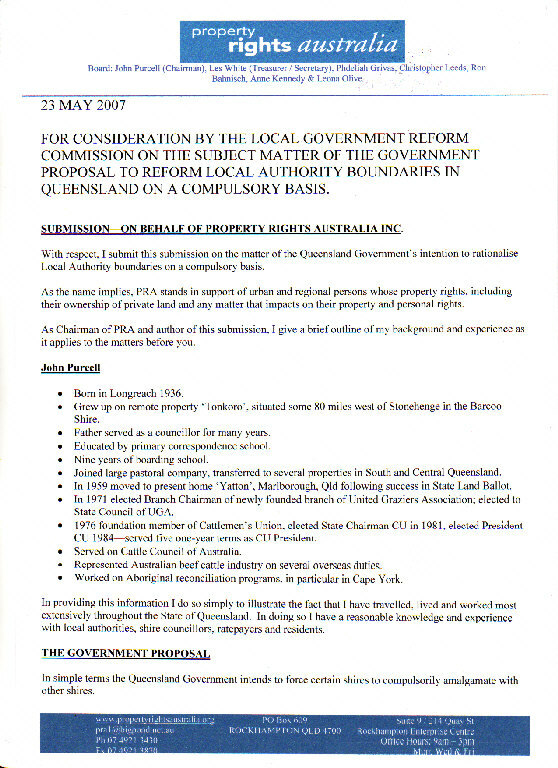 For a printable copy of this document, click Page 1 and Page 2. FOR CONSIDERATION BY THE LOCAL GOVERNMENT REFORM COMMISSION ON THE SUBJECT MATTER OF THE GOVERNMENT PROPOSAL TO REFORM LOCAL AUTHORITY BOUNDARIES IN QUEENSLAND ON A COMPULSORY BASIS. SUBMISSION-ON BEHALF OF PROPERTY RIGHTS AUSTRALIA INC.
With respect, I submit this submission on the matter of the Queensland Government’s intention to rationalise Local Authority boundaries on a compulsory basis. As the name implies, PRA stands in support of urban and regional persons whose property rights, including their ownership of private land and any matter that impacts on their property and personal rights. As Chairman of PRA and author of this submission, I give a brief outline of my background and experience as it applies to the matters before you. Grew up on remote property ‘Tonkoro’, situated some 80 miles west of Stonehenge in the Barcoo Shire. Father served as a councillor for many years. Educated by primary correspondence school. Nine years of boarding school. Joined large pastoral company, transferred to several properties in South and Central Queensland. In 1959 moved to present home ‘Yatton’, Marlborough, Qld following success in State Land Ballot. In 1971 elected Branch Chairman of newly founded branch of United Graziers Association; elected to State Council of UGA. 1976 foundation member of Cattlemen’s Union, elected State Chairman CU in 1981, elected President CU 1984-served five one-year terms as CU President. Served on Cattle Council of Australia. Represented Australian beef cattle industry on several overseas duties. Worked on Aboriginal reconciliation programs, in particular in Cape York. In providing this information I do so simply to illustrate the fact that I have travelled, lived and worked most extensively throughout the State of Queensland. In doing so I have a reasonable knowledge and experience with local authorities, shire councillors, ratepayers and residents. In simple terms the Queensland Government intends to force certain shires to compulsorily amalgamate with other shires. Firstly, PRA contends the Government has no mandate for this action. The Government has not sought the views of the people most concerned and most affected, that is, the ratepayers and the residents of these shires. The Government uses the proposition that some shires are ‘at risk’. If these shires are now at risk, please consider their status and viability should their shire be stripped of a local presence, e.g. their council and workforce. Maintain/support the community with involvement and encouragement with local activities, e.g. Small towns will whither on the vine. To take the shire council and all that it stands for and those involved with the council from a small community is akin to removing the heart and guts from a human. The promise to maintain employment for council workers for a two-year period is an empty and cruel gesture-will the Government continue to employ all council workers in their current town/home-how and where will they work, and where will they live? This whole process has a hidden agenda and ulterior motives centred on more power and control to the Government for reasons best known to the Government. This proposal is destined to be no more than a tragedy and disaster waiting to happen. 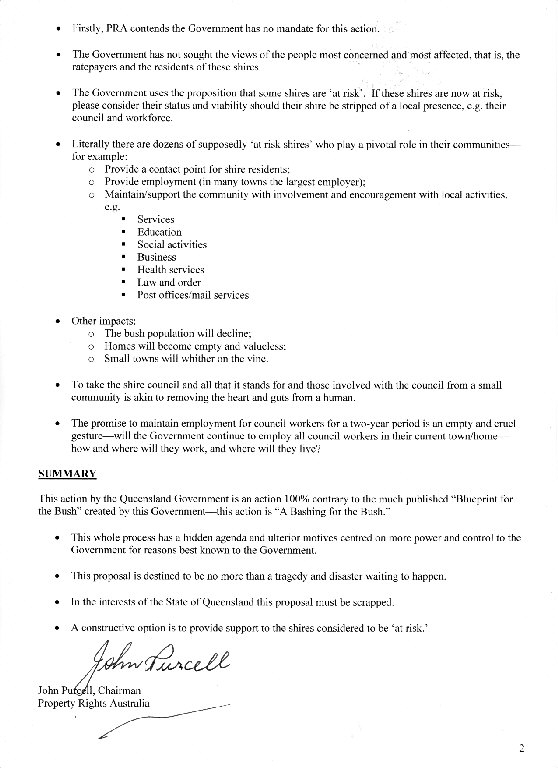 In the interests of the State of Queensland this proposal must be scrapped.